This simple hostel can be found in Santa Brigida. The hostel comprises 26 cosy guests rooms. The reception is open 24/7. Pets are not allowed at this property. Make yourself at home in one of the 21 guestrooms. Bathrooms have bathtubs and hair dryers. A stay at Hotel Pujol places you in the heart of Las Palmas de Gran Canaria, walking distance from Poema del Mar Aquarium and Ciencia y la Tecnologia Museum. This hotel is within close proximity of Santa Catalina Park and El Muelle Shopping Center. 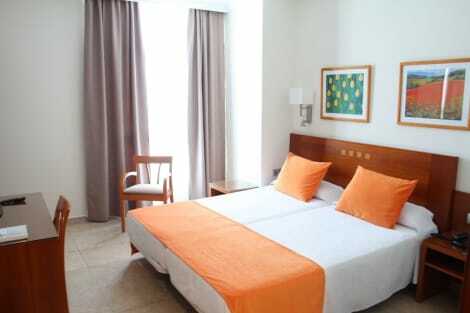 This cosy apartment hotel enjoys a great location in the area of the Parque Santa Catalina of the capital of Las Palmas on the popular holiday island of Gran Canaria. The beach of Las Canteras, one of Spain's most beautiful urban beaches, stretches over 4 km and is only steps away. Numerous shops, restaurants, bars, pubs and entertainment options are in the vicinity. When you stay at Catalina Park in Las Palmas de Gran Canaria, you'll be near the beach, within a 5-minute walk of Las Canteras Beach and Santa Catalina Park. This apartment is 3 mi (4.8 km) from San Telmo Park and 3 mi (4.9 km) from Calle Triana.